Hello crafty friends! I am back. My son was ill last week with a stomach bug so I was pretty much offline and out of my craft room so I missed you all last week. I have made a decision that I feel good about. I have decided that I am going to post to WOYWW every other week because the busy times are approaching and if I can manage my own expectations I won’t be so down when I miss a week. Twice a month sounds more doable at this time. So I will not be here next week in case you look for me. I am beginning my Christmas cards production. On my desk you can see some images that I need to color up for holiday cards. 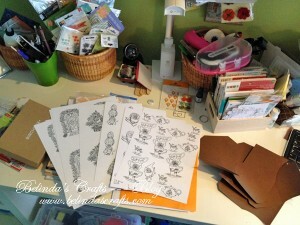 To the right of it the brown cardstock is some paper cut out on my Silhouette. It is for a mini album I am working on. To the left of my images is my Birchbox which came in the mail today. It is a company I pay a very small fee and monthly they send me sames and some full size items of beauty products. Tomorrow I will post the contents for this month’s box. I love receiving them. It’s been really fun. 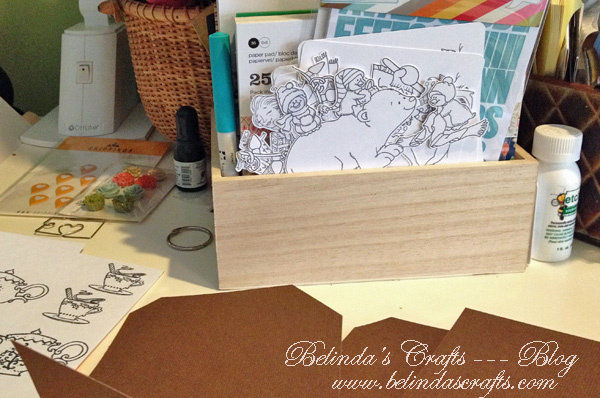 In the box to the right of my image is all of my 6×6 holiday paper packs. I have so many they are busting out of the box. I don’t know about you but I am a sucker for holiday paper. Some cute digis I need to color. Above is some winter images that I cut out with my Silhouette and need to color them. I love looking at them while I work. But I guess I better get to coloring them. I am going to keep this short so I can visit some desks. I hope you all have a blessed day and thank you so much for visiting and leaving comments. I am like you – I am a sucker for holiday paper. I need to try cutting digis with my cameo – I’ve watched the video, but haven’t tried it yet.